Note: This feature is composed of both written and video content. Please make sure to watch the videos throughout as they provide much of the analysis. Rankings and consistency matter in combat sports, but only up to a point. Unlike any other major sport you care to name, combat sports are happy to set aside the most sensible match ups in favour of the most appealing ones. Unlike fans of football, tennis or basketball, fight fans also have a degree of democracy: each dollar spent at the gate or on pay-per-view serves as a vote for “more of this”. Sometimes this works to the benefit of the audience, when the money on the table for the best guys in the sport is just too much to turn down. Other times it works to the detriment of the game. After all, why should the promoter of one fighter run around and jump through hoops for the promoter of another when he can get just as many saps in to watch his fighter crush some schlub or questionable mandatory challenger? On the one hand it is disappointing that Conor McGregor is perched atop of the most competitive and fast moving division in mixed martial arts but has fought just a couple of the top contenders there. On the other hand this fight—Conor McGregor versus Floyd Mayweather—serves as a reminder that the fight game still provides more peculiar storylines than could be thought up by a team of screenwriters and that it still, for better or worse, belongs to the people. This writer was in the camp that said it would never happen. It seemed as though Floyd Mayweather was too proud of his accomplishments to sully his fiftieth career victory with a 0-0 professional boxer. Many said that Nevada would never even sanction the fight. But they clearly didn’t know how commissions operate—Nevada has been so desperate to help this fight along that they even waived their mandatory 10oz. glove size just to allow "Mayweather - McGregor to be Contested with Small Gloves” to make the rounds and to get some press attention from those gullible enough to think that 8oz. gloves are somehow "McGregor’s terrain". But money is money whether you fight in the soul-crushing tedium of the nine-to-five, or sell your brain cells away in front of crowds baying for your blood, and money brought us whatever this is. Frankly, McGregor could come out in the first round, take a knee, take the count, and we would only have ourselves to blame. But if there is one thing that is compelling about Conor McGregor it is that no matter what costume he is wearing, or line he is reciting the day before a fight, he always fights exactly as he promises. Before we continue, let us examine (in video form) the game that has carried Conor McGregor to two UFC titles, past the greatest featherweight of all time, and has allowed him to carry one of the highest knockout ratios among the elite of mixed martial arts. Almost everything you read or hear about this fight will refer to Conor McGregor’s left hand and speculate on whether Floyd Mayweather can "take it". The thinking seems to be that McGregor is ‘just’ a left hand in MMA and that works well enough, so it should hold up decently in boxing. Studying the above video, it should be clear that McGregor’s kicking accounts for much more of his success than many would admit. The go-to response to a punch in boxing is head movement—it allows a fighter to stay in range and gives him a much, much better chance at countering. But slipping past a punch also presents the chance to step out the side door and escape. With McGregor constantly throwing up the left high kick against his opponent’s forearm, they are cautious to duck and hindered in circling past his power hand. Then there is the fact that McGregor’s lead hand is almost an afterthought in mixed martial arts. He fights in such a bladed stance that when an opponent circles past his lead foot he cannot hook dexterously. The wheel kicks and back kicks he uses so frequently serve to deter movement in that direction and occasionally punish it. Then there is McGregor’s money punch, the retreating left hand. The problem is that in mixed martial arts he can keep fighters at range and pound them with kicks, putting the pressure on them to get to him. This is where you will see opponents sprint towards the Irishman and expose themselves to easy counters. This oft referenced MMA distance’ has no reason to exist when there is nothing maintaining it. Floyd Mayweather likes to lead with the left hook or a long right hand lead as much as anyone, but how often can you recall him falling short as an opponent retreated? Everything a master boxer does is from the edge of range—just as with a fencer. There is nothing a fighter can do in a boxing match to force his opponent any further back than the furthest reach of his jab. Should McGregor’s gameplan hinge around maintaining that extended range and hoping that Mayweather is daft enough to lunge in wildly after him, only his feet will be able hold that space. In a square ring a couple of steps back will quickly take a fighter to the ropes—then if retreat is your main means of defence most of your options are off the table. But the number one rule of fight writing is to not count any fighter out of any fight. Before we examine ins and outs of the match up itself, let us examine the A-game of Floyd Mayweather Jr.
Floyd Mayweather has kept a faultless record through his absolute mastery not just of the art of boxing, but of the sport of boxing. No one plays the clock, the refs, and the judges better than Mayweather. He knows every letter of the rules and how to flaunt them in ways which won’t get called. He knows just when he needs to work to take a round, and by the half way mark of any fight he seems to know his opponent’s intentions better than they do. Mayweather fouls readily, scores when he wants to, and prevents his opponents from throwing even half the blows they normally do. The old saying goes that sixty-punch-a-round fighters become thirty-punch-a-round fighters against Mayweather. Mayweather’s lead right has always been his favourite punch, and while fighting against a southpaw makes the stonewall style of guard less of a catch-all defence, fighting a southpaw opens up more opportunities to score with the right hand lead. The story goes that after Mayweather’s first professional bout against a southpaw his father telephoned young Floyd’s handlers from prison to demand that they never put him in the ring with a southpaw again. We are a long way removed from that though, and however you felt about the action in the Manny Pacquiao fight you must admit that Mayweather looked comfortable against perhaps the most accomplished southpaw in boxing history. So having rained all over the ‘southpaw with crazy mixed martial arts angles’ parade, is there any reason for you to care about this fight aside from the spectacle? Well, yes. Floyd Mayweather has never been a man to put a blistering pace on his opponent or put forth a Chocolatito-esque punch count. He averaged just under forty punches thrown a round through his career. What he does so masterfully is deny his opponent opportunities to land blows. Sometimes that is through beautiful work on the very edge of their reach, deceiving them into reaching and then pulling his head back and returning with a corking right hand counter. Just as often, however, that is through smothering his opponent. An alarming amount of the work done by the generation’s best boxer, isn’t what most fans would call boxing. Tie ups, snap downs and cross faces are all more valuable to Mayweather’s game than his crisp body jab or checking left hook. He so rarely looks winded in a fight, and so rarely gets hit more than a couple of times a round, because whenever his opponent steps in on him he is more than happy to duck in low and come up holding a clinch. Mayweather is masterful at taking breaks and that is where this match might get interesting. For Floyd Mayweather, there are a fair few things he might be able to exploit in Conor McGregor’s boxing at range. McGregor’s jab is an afterthought in many of his fights—though he has had kicks to work with instead—so waiting for pull counters off single jabs might not be the best idea. However when McGregor does lead with his hands in mixed martial arts he will often flick out a long, leaning left straight without stepping to either the outside or inside angle, and then fall prey to ‘admiring his work’ with his hands down. Mayweather’s counters tend to work one of two ways though: he likes the pull-back right hand over the top of an opponent’s probing jab, and he likes to catch-and-pitch off the shoulder roll when he can draw out his opponent’s power hand. The nice thing about drawing the opponent’s power hand is that you know what you’re getting, and there’s a good chance they’ll be stood still for a moment after they miss. Mayweather tends to use the high guard much more against southpaws, enticing a body shot. McGregor often throws in a long left straight to the body in his fights, during which that pause in the moment of off-balance is especially obvious. If Mayweather can draw the left hand on his guard or to his body, the counter left hook might work a treat. One of Mayweather’s favourite hurting set ups against the southpaw is that jab to the inside angle and skipping past to the open side. The problem is that while this sets up some of his best blows against southpaws, it also gets him clocked more than most of his methods. It is probably Floyd’s look that shows least of that Mayweather caution. While it is a slick way to put a hurting on a southpaw, it might be worth avoiding this in the early going and looking for in once McGregor begins to slow in the later rounds. On the subject of gas tanks, twelve rounds of professional boxing is a big ask even for those coming from the amateur ranks. There’s a reason that every successful amateur not named Lomachenko has spent a long time building up towards the serious fights. As he is being paid more than most of us will see in a lifetime, there is no reason to suspect that Conor McGregor will come into this bout in anything but the best shape of his life, but boxing a twelve round professional contest is a big unknown for anyone with no professional boxing record. Mayweather isn’t known as a big hitter or a relentless body puncher, but he can get to the midriff with his excellent body jab, his powerful right straight, and also neat counter punches on the inside as he did with his right uppercut against Maidana the second time around. Nate Diaz’s bodywork against McGregor in their second fight worked well when he committed to it, and McGregor’s own desire to hit with power in every exchange can also drain him. Getting to the body early and often to slow McGregor, even if it is with single shots, seems as though it would be a sound idea for Mayweather. There has been some talk about McGregor using the inside angle to set up his left hand (that is stepping to the inside of the opponent’s lead foot). Obviously it depends on the context but Manny Pacquiao uses the inside angle extensively to set up those 1-2-up jab-everything else combinations. Each time Pacman cornered Mayweather and stepped in to get off his five punch flurries, Mayweather would pivot out behind the lead shoulder (occasionally accompanied by a left hook) and escape to the other side of the ring. While actively tripping is obviously illegal in boxing, a nice bonus about taking a strong strong outside angle with the lead foot—aside from being harder to pivot away from just because you are a foot or so further across—is that if the opponent attempts to pivot out like this they can wind up stumbling over themselves while still in hitting range. 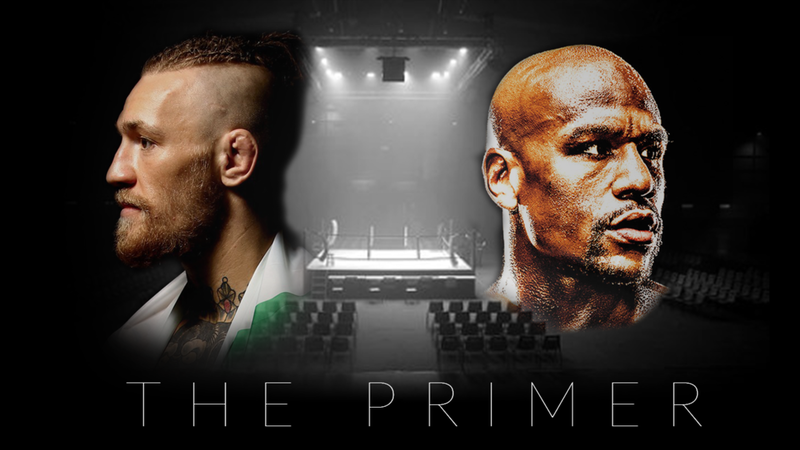 While there may be times when the inside angle will work nicely, it seems as though the outside angle might be McGregor’s best friend against Floyd Mayweather when you consider his strengths. When confronted with an outside angle against a southpaw, particularly along the ropes, Mayweather will perform a deep duck to his right side and either run past the elbow or come up into the clinch. For Manny Pacquiao, who was completely clueless about either preventing or breaking the clinch, this was disastrous. For Conor McGregor, a man who has wrestled every day for the last decade, this is where he may be able to make Mayweather suffer. No single thing that Floyd Mayweather does is unique—in fact for almost every skill or tactic he has shown in his career, he has himself fought and beaten someone else who employs it. When you study how Mayweather deals with opponents ducking down to their open side and moving in to clinch it is almost always the same—he drops a forearm on the back of their neck or wraps over their head, then he drops his weight on them. They are forced to carry his weight in this bent over position and Mayweather milks it for a few seconds, pretending not to hear the referee calling for the break. Other times Mayweather will use the forearm in front of the opponent’s collar bone to line up a good right straight, or pass the opponent under his armpit to accomplish the same. As discussed in our third video, Mayweather’s most successful opponents—Maidana and Cotto—have been those who have been able to fight out of the clinch and prevent Mayweather from taking breaks or smothering the action when he is uncomfortable. That is partly their knowledge—Manny Pacquiao and Canelo Alvarez were effectively useless as soon as Mayweather’s chest hit theirs—but it is also alarmingly reliant on the referee. Compare a Kenny Bayless break to Miguel Cotto being given time to fight out of the clinch by Tony Weeks, and managing it within moments of Mayweather grabbing him each time. Unfortunately the rules of boxing are basically open to interpretation by the referee, and most referees have a pet peeve and then complete blind spots for other fouls. In Mayweather’s first fight with Jose Luis Castillo, Vic Drakulich was one of the few referees to deduct a point from Mayweather for his repeated use of the elbow, and to warn him for his constant pushing. That same referee seemed completely oblivious to other obvious fouls, however, including Castillo quite literally arm dragging Mayweather and throwing straight shots into his back. It was so unbelievable to see the referee fail to even raise an eyebrow that an incredulous Mayweather and Castillo shared a laugh afterwards. Mayweather’s desire to clinch and take breaks may give McGregor the chance to either tire him out or foul him relentlessly depending on what he can get away with. Cotto’s head placement prevented Mayweather from getting chest to chest and gave Cotto the chance of a good overhook on Mayweather’s left arm (which almost always shoots in under his man’s armpit). The overhook with the head underneath the opponent’s is a beautiful infighting position—Roberto Duran excelled from this hold. Here’s a nice clip of Jeff Fenech lazily showing how to take the overhook and get the head underneath the opponent’s. 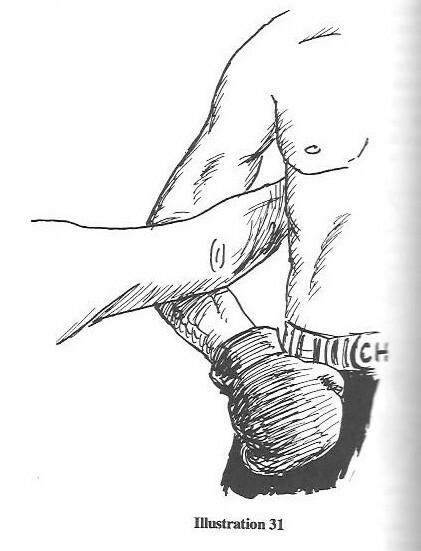 The other advantage of a good overhook, as opposed to the overhook a boxer who simply stands there and lets himself be cuddled, is that it can put a good deal of wear and tear on the opponent’s shoulder. Marcos Maidana looked for that classic Mike Tyson armbar at one point against Mayweather. Barring the arm against the body rarely achieves much, and no one is going to get away with the Jon Jones shoulder crank in a boxing ring, but a fighter only need to jerk his opponent’s elbow inward towards their centreline a little when he is not expecting it to jar the shoulder. In many ways McGregor would do well to imitate the great Sandy Saddler. When Saddler met Willie Pep, Pep was the slickest thing to ever lace up gloves: a dancing master and a marvellous scientific boxer. Over four fights Saddler fouled and battered Pep to three victories, all inside the distance. In the third fight Pep was forced to retire with a shoulder injury because each time he entered a clinch Saddler jerked him around by the overhook. Saddler was also masterful at throwing short range ‘uppercuts’ that almost always missed and allowed him to cut his man up with the elbow. As we’re knee deep in hypotheticals about a boxer we have never seen box, let us lay out a comprehensive gameplan that might be able to bring McGregor’s strengths to lever against Mayweather. Mayweather’s desire to stay on the end of his opponent’s range means that a good, non-committal double jab will see him give ground. Double jabs, up-and-down from McGregor might be used to move Mayweather to the ropes, at which point McGregor should step deep to the outside angle to encourage Mayweather to run the ropes in the opposite direction. If possible McGregor should hold off on the left hand until he knows he is close enough to force the duck in. When McGregor throws the left straight—in the early going at least—it would be good to see him shoot it towards Mayweather’s sternum. Knowing that Mayweather will duck, the impact should slow his move towards the clinch, but is also a solid body shot. The duck in is the most desirous outcome. Dropping the right forearm on Mayweather, McGregor should make Mayweather carry his weight in the classic Mayweather style. The pass-under is a great way to achieve an angle and line up a power punch while the opponent is stooped over from this position. Mayweather himself uses this a great deal and, while analysing ten seconds of sparring footage is usually a mug’s game, McGregor shows it against Paulie Malignaggi. For some variety, if he can frame or push down with his left forearm when Mayweather comes in, there is the possibility to step out into an orthodox stance and throw in a right straight from the new angle. Mayweather used this against Castillo and you can also catch Andre Ward do it when he’s switch hitting. If he can time it so that his right forearm beats Mayweather’s lead shoulder, he can frame with the collar tie and look for a second left hand as Mayweather gets trapped in between punching range and the clinch—the range at which Mayweather did his damage to Ricky Hatton. Doubling up on the left hand along the ropes is something that McGregor could benefit a lot from doing. Faking the left straight over McGregor’s shoulder and delivering a legitimate uppercut to the solar plexus as Mayweather ducks in. While an orthodox fighter, Castillo had success with this pairing, and it is essentially the same punch that Mayweather used to slow Maidana in their second fight. Hitting the ropes it is important to consider when Maidana and Cotto did and did not have success. If there is no physical pressure on Mayweather, pushing him into the ropes, he can stagger his feet and turn his body, allowing him to shoulder roll and protect himself from flurries as he did against De La Hoya and so many others. 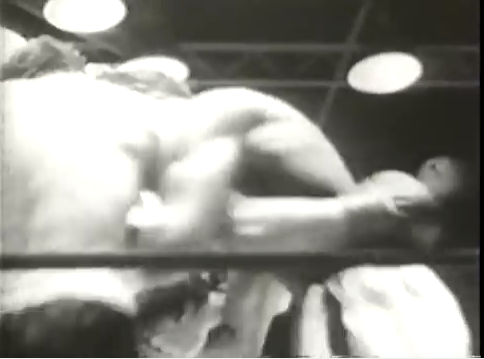 It is possible to get to Mayweather’s body when he is squared up along the ropes in the traditional ‘gloves up’ defence, which he goes to if he is clipped in the head—but it may be possible to force this by driving the head in underneath his or into his sternum, in the style of a classical infighter. But it is worth noting that the more physical a man gets on the inside, the more Mayweather begins to dig with the elbow and even look for forearm smashes (craftily on the other side of the infight from the referee). The weakness of many of the greatest pasty fighters has often been that their skin tears like a lace curtain when put under duress. A quick elbow from Chad Mendes cut McGregor in their fight, and a crafty face rake from the currently suspended wrestler opened McGregor all the way up. Mayweather constant use of the elbow might be his best answer to getting manhandled. Interestingly the two uses of the elbow in the below clip came just seconds apart, but the referee missed the clear forearm smash and deducted a point for the projection of the elbow during the clinch, only after warning Mayweather for this same tactic in each of the previous nine rounds. Boxing matches hinge on referees as much as trials hinge on judges. It is unfortunate that McGregor’s right hand just hasn’t looked like anything special through any of his fights, as Mayweather has often run himself onto counter right hooks when fighting southpaws. A high guard to draw Mayweather’s right straight to the body would be a perfect time to crack him with the counter right hook, the mirror image of his favourite check hook against the southpaw. Constant pressure and keeping the gloves up seems like the best bet for McGregor. Any time Mayweather reaches for a clinch, that is his chance to wear on the great champion without eating punches and being embarrassed at range. Shooting the left straight at Mayweather’s chest and bringing it up as he slows, McGregor might be able to begin finding his money punch as the rounds progress and Mayweather isn’t allowed his usual rest periods in the clinch. The more you examine this fight, the easier it is to convince yourself that McGregor’s chances aren’t quite as slim as you first thought. So much of Mayweather’s game is the clinch, he is forty years old, and historically it has been southpaws and fighters who can deny him the clinch that have done best against him. Then you remember that Mayweather has done this every day since he was a child, has beaten everyone he’s met in the ring as a professional, and has never taken a fight he isn’t absolutely certain of winning. But where is the fun in thinking like that? Even if the fight is as one sided as everyone believes it will be, what a fun mental exercise it has been. Even if we are all left feeling like we were conned in the aftermath, this writer at least will be fascinated to see just how much ‘not boxing’ McGregor and his team can put on Mayweather without a disqualification, and how Mayweather’s many fans will react to his own tactics being used against him by a man who should be stronger in those grey areas.